There are many different types of tour companies out there whether you’re taking people to see the sights around your city or helping them to explore your facility. No matter what, you’re going to need to deal with bus leasing, especially if you want to take more than a few people at a time. Traditionally, one of the most common methods for transporting guests has been through a large passenger van, but that is simply no good for touring purposes. Why? We’ll explain it in detail. Viewports – Put quite simply, these are the windows, and if you’re giving a tour you want your visitors to have a good view of the area that they are touring. This isn’t always easy, but with the right bus you will be able to provide not only an unobstructed view of the scenery outside, but decent UV protection for your riders. One of the benefits of having a quality bus is the ability to ensure your riders do not become too hot, and most certainly not too exposed to the sun’s UV rays. Space – With bus leasing you have much more space to work with. We’re talking about better seating, bigger aisles, and even more headroom. Many of our options are very well suited to touring, and they allow your customers to ride in comfort. It’s a lot safer too! ADA Compliance – We’re not going to mince words here, it’s hard to meet ADA compliance with a van. The Americans with Disabilities Act made it necessary to equip most public vehicles with wheelchair accessible components, such as hydraulic lifts. Our buses make it much easier to comply with this rule and even make it possible to host more than one wheelchair in the vehicle. These three items are very important to consider when looking for a bus but you also have to remember the technical side of the equation when you are looking into a bus for your company. How easy is it to repair? How efficient is it? How much is it going to cost? Atlantic Bus has a great selection of buses both new and used, ensuring that you get the vehicle you need for your organization at a price you can actually afford. If that’s not a good deal, we don’t know what is. Additionally, Atlantic offers a line of used buses all made after 2008. There is little to no doubt that continually operating as a tour bus will be hard on your vehicle, and you will need to replace parts sooner or later. The thing about a bus however is that you can’t simply replace those components with anything you find on the market. You need something heavy duty, you need something that works well, and you need something that is going to last for the foreseeable future. Most importantly, you’re going to need a fair bit of guidance. A premier provider of buses and bus parts, we’re able to offer you sound advice on getting the best parts and keeping your bus running for the foreseeable future. In addition to ensuring you have the right parts we are one of the top bus repair facilities in the country, ready to get your vehicle repaired and back on the trial as quickly as possible. One of the things we truly understand is how dependent your company will come to be on the buses we provide. You will more than likely find that you simply cannot proceed without a functioning bus, especially in the case of a tour company. In other words, don’t buy a lesser bus from a lesser company. 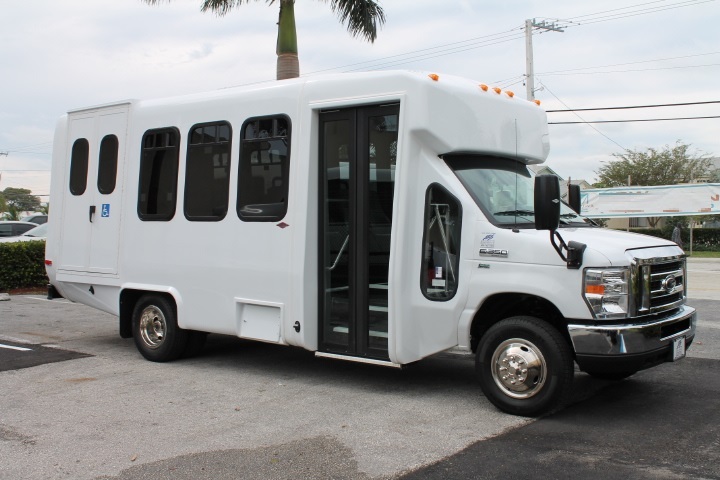 Take a look at our inventory and make sure that your organization is outfitted with the best shuttle buses in the country. We have a variety of styles, floorplans, makes and models ready and waiting for you.